Animal Kingdom is such an interesting park. It’s not quite in the state of flux that Hollywood Studios is experiencing, but it is on the precipice of new attractions, lands, and shows, making it a much different park than it has been in the past. 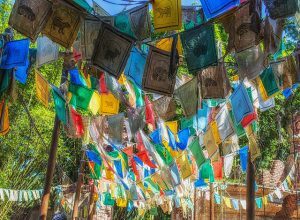 Unaffectionately dubbed the “Half Day Park,” Animal Kingdom has tons of imagineered elements that make it a true full day park, but are often overlooked or mistakenly pushed aside as glorified zoo exhibits. I admit I have been guilty of overlooking such attractions and not enjoying the true ambience of the park. Much like Epcot, there aren’t too many actual rides to go on, but the atmosphere and detail of the park really differentiates it from any other theme park, let alone a standard zoo. Take the time to let the park engage you and wrap you in its story, and Animal Kingdom can be quite enchanting. From a planning perspective, the “best” rides and attractions are really spread throughout the park, so there’s no truly efficient way to maneuver between them. For the sake of planning a full day in which we hit all the best Animal Kingdom has to offer, I try not to worry too much about FastPass+ or about efficiency in terms of going from one end of the park to the next. For our purposes, I’m going to walk through what I feel is an ideal day, simply jumping from attraction to attraction based on what time of day it’s best to go. It should be noted that the inherent inefficiency of the attraction locations lends itself to lengthening your time in the park, thus debunking the “Half Day Park” misnomer. If this is not your speed, or if you are looking for the most efficient route possible to fit in the max amount of rides and attractions, day, I recommend downloading a touring plan to map out your day. Ultimately, for a single day at Animal Kingdom, my goal is not efficiency, but to have a well balanced day in an attempt to strike a balance between the “go-go-go” mentality and being a little bit too blase. Arrive Early: When you only have one day at a Disney park, it’s best to go dusk-til-dawn in order to get the most out of your day. Arriving to the park at “rope drop,” or when the gates open is the best strategy to beat the crowds and get more in before the day gets too hot and crowds get too big. Arriving early has an additional benefit at Animal Kingdom because this is the time of day when the animals tend to be the most active. Buy Tickets Ahead of Time: Even in the off season, ticket lines can get long, and waiting in line for them is only wasting precious time! Use FastPass+: While it’s not essential to use FastPass+ in Animal Kingdom, it can help on some of the bigger rides. Quick dining/snack spots: In the interest of saving time, it’s good to know that there are tons of great quick service dining locations that offer snacks or food on the go. If you’re trying to be more efficient with time, you can always grab a quick lunch or fill up on snacks while walking to your next destination. Rider Switch: Also called Child Swap, this service allows parents traveling with infants or small children to “swap” or take turns riding bigger rides without having to wait in line twice. Here’s how it works: If you go on a ride with a height requirement, tell the Cast Member at the line entrance that you’d like to use Rider Switch. The Cast Member will give the waiting portion of your group a Rider Switch pass (which works like a FastPass+) and the riding portion of your group will proceed through the line. Once the first riding group gets off the ride, the waiting group can then go through the FastPass+ line to ride next. First Aid: Since you’ll be at the park all day, it’s good to know your options should anything happen. 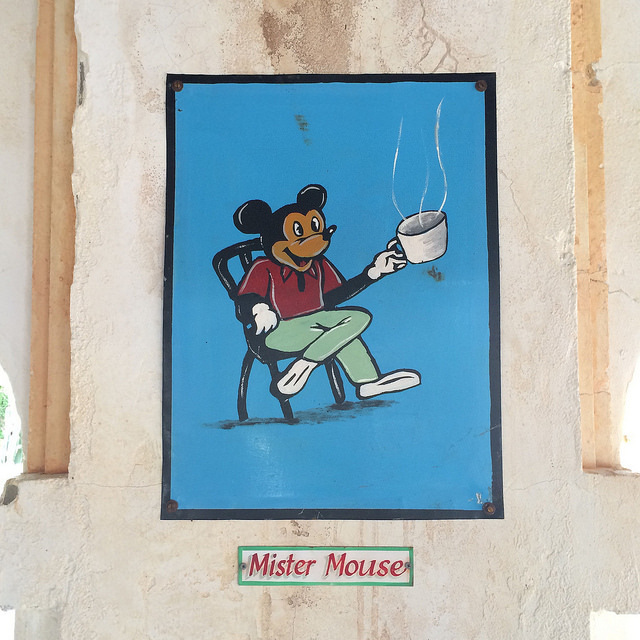 There is a first aid station located behind the MyMagic+ Service Center in Discovery Island, near the bridge to Africa. There are on-site nurses offering everything from bandages to over the counter medications. My favorite way to start a day at Animal Kingdom is to stop at the Kusafiri Coffee Shop & Bakery for some breakfast. Many people flock to this location because it serves “real” coffee as opposed to some of the other stuff served around the resort. It’s located right next to Kilimanjaro Safaris, making it a perfect first stop before catching a morning safari. Alternatively, if you’d rather do Kilimanjaro Safaris before a coffee break, you might catch some better light for photos and the animals will be at their most active. To get back to the Kusafiri Coffee Shop and Kilimanjaro Safaris, you’ll have passed through Discovery Island into Africa. At this point, I like to either go back to Discovery Island to catch a show of It’s Tough To Be A Bug, or stay in Africa to view Festival of The Lion King. The order will depend on showtimes for the day. 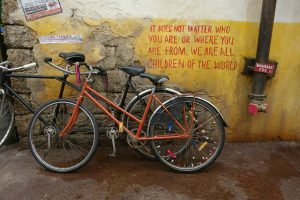 If you’d like a mid-morning snack or a quick drink, head back to Africa and wander through the Harambe Village. I’d recommend Wanjohi Refreshment at this point in the day. If you’re already hungry for lunch, Harambe Market is a good spot to stick around for some awesome eats. You can also come back here for a mid-afternoon snack or a shady place to rest during the heat of the day. If you’re not quite ready for a meal, head over to DinoLand, USA. While this may be the lamest of the lame when it comes to theme park lands, the main attraction DINOSAUR really isn’t to be missed. Catch a ride or two if it’s not too crowded. This may be a good FastPass+ attraction. 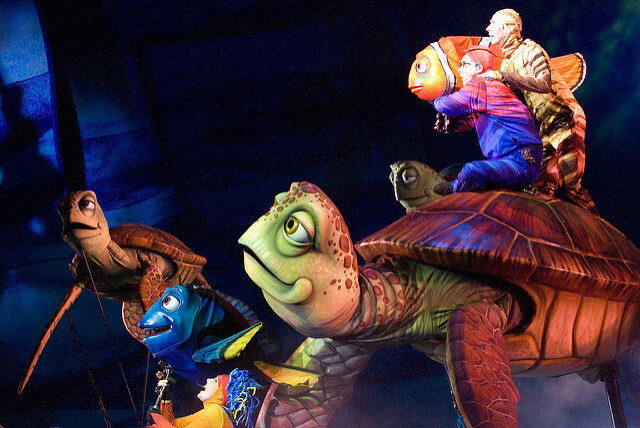 While in DinoLand, USA, make sure to see Finding Nemo: The Musical. Again, it’s tough to make a call on what time of day will be the most efficient to see this show since 1) it’s in an area where there’s very little else to do, and 2) showtimes vary daily. But, having said that, the show really is not to be missed, so do what you can to fit it in your day. There are several great options for lunch spanning the park from Africa to Asia. Flametree Barbecue is in Discovery Island that serves delicious St. Louis style barbecue and is a popular spot due its expansive and shady seating. Yak & Yeti can’t be missed and has one of the most fun and interesting themes in the park. It’s themed to look like a Himalayan hotel and there are tons of unique details and Easter Eggs to see inside. Yak & Yeti offers really good Asian Fusion food and though it’s a table service location, you can find a quick walk-up window nearby for a quicker meal. Tusker House is a buffet that offers great food in a nice atmosphere where you can get a fun character meal. By now, we’ve really done everything but the attractions in Asia, so we can hit it hard in the afternoon. If it’s a particularly hot day, now would be a nice time to do Kali River Rapids and cool off since you’re pretty much guaranteed to get wet. 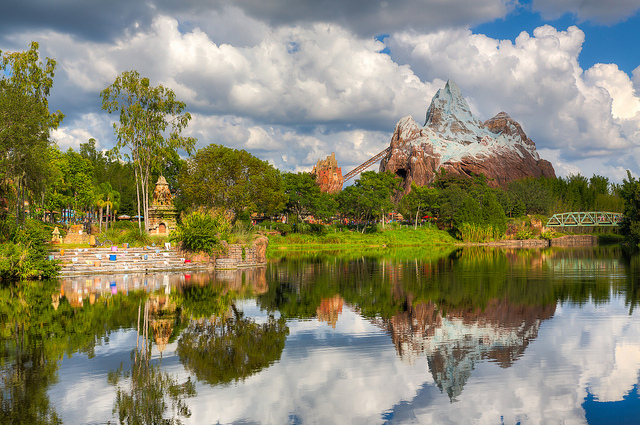 I’d recommend getting a FastPass+ for Expedition Everest as it’s the primary attraction in Animal Kingdom. However, depending on the time of year you visit, it may not be as crucial to get a FastPass+ as it would during peak times. Also not to be missed are the highly underrated attractions Flights of Wonder and Maharaja Jungle Trek. Admittedly, these are two that I’ve completely skipped in the past, disregarding them as glorified zoo exhibits. Let me say, I was wrong. Flights of Wonder is an interesting and funny show featuring highly talented and beautiful birds of prey, while Maharaja Trek is, in a word, awesome. The wildlife trail features animals and vegetation known to the Indian subcontinent, but what makes it really “Disney” is the architectural elements along the trail that transport you to another time and place. Think Jungle Cruise meets walking trail, just without the corny jokes. The newest location in the park, Tiffins Restaurant is the first signature dining location in Animal Kingdom that celebrates the global art and culture that inspired the park. Tiffins is an English-Indian word referring to a portable midday meal not unlike a lunchbox. The atmosphere and detailing are exquisite full of rustic and global elements along with a literal art gallery inside the restaurant. I love the main gallery wall with patchwork art made out of Animal Kingdom costumes and animal shaped lanterns. This place is an excellent spot to have an amazing meal at the end of a long day where you can really take in the culture and feeling of Animal Kingdom. The menu is currently the same for lunch and dinner and is some of the best food on Disney property. The newly imagineered night time events are next on the docket. I love that they are quite unique to the ambience and theme of Animal Kingdom while still maintaining that Disney quality we are so used to seeing in the night time shows. 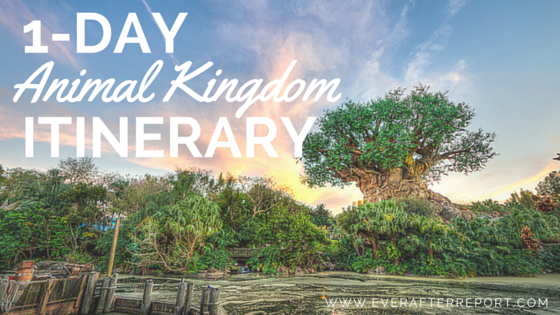 In Discovery Island, be sure to see the Tree of Life Awakening. Every 10 minutes or so, the Tree of Life literally comes to life with light beaconed by millions of little fireflies. The tree becomes a platform for storytelling through light and music, and it’s a show that’s not to be missed. The Jungle Book: Alive With Magic is a limited time show based on the live-action Jon Favreau film, The Jungle Book. 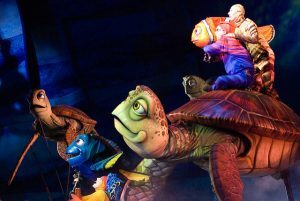 Shown on the shores of Discovery River, the show follows Mowgli’s adventures through music, live performances, special effects and high production value a la Fantasmic. It’s said to be the temporary show since the Rivers of Light launch was postponed, so we’ll see how long the “limited time” actually lasts. What did I leave out? 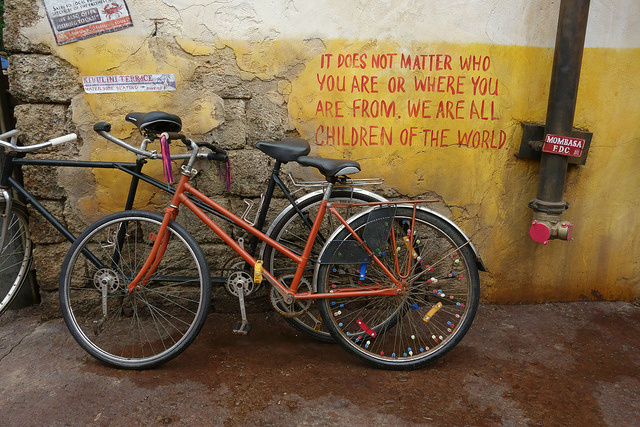 Is there anything else you would include in a day at Animal Kingdom? Share your questions and thoughts in the comments! Thanks for reading! I would really appreciate it if you share this post on social media, or better yet, leave a comment below so I know how I can make this a great resource for all Disney planning.